Free DLC for VIPs = great! Games can last TOO long! 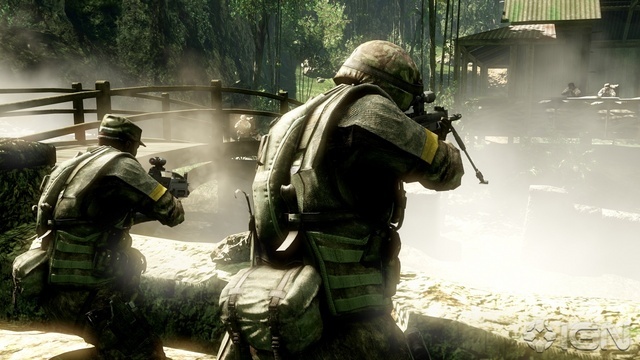 EA/Dice's online shooter takes the Battlefield series to a whole new level of fun, but not without a few issues. Overall it's still a great experience. Nor is it supposed to be. The two games are VERY different and you cannot approach them the same way. Let's start off with what BC2 is. BC2 is a TEAM based game; it's tough to be a star player in the game. In MW2 I have a 2.1+ kill ratio or so, in BC2 it's around 1.3 I believe. You MUST rely on your team to win games, and winning can be very tough. On the downside I can have a great game by myself on MW2, it can be frustrating playing with non-team focused people when playing with people I don't know. But when it does work correctly it is a blast. 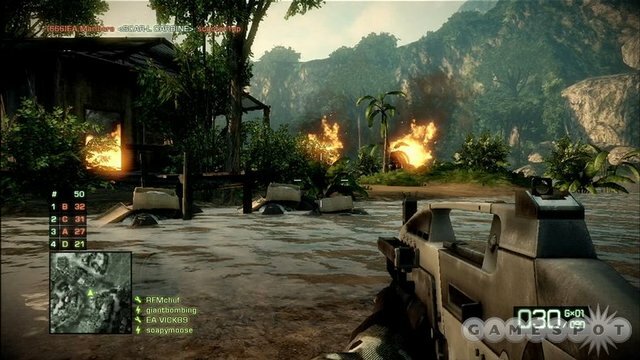 The graphics are not as sharp as MW2, but then again the maps are 10 times the size. Instead of going for high poly counts and great looking textures, DICE opted for scale. The draw distance is fantastic, there is SO much going on, and the destructible environments are a really cool touch. Instead of being able to hide inside of a building for cover you've got to watch out, a tank shell will blow the wall out of a building with ease. The gameplay mechanics aren't as smooth as I'd like. Running and moving feels robotic, gun recoil feels off. It's not bad, just a little choppy. The graphics are nothing to gawk at, the PC version of the game is quite sharp but the consoles get the shaft. One place where the game blows MW2 out of the water is with the audio. The sounds of battle have never been better. Gunshots and explosions sound deep and realistic adding to the chaos of the battlefield. The single player campaign is alright, but not great. The story is weak but the action is solid. The dialog adds a good bit to the story with each of the squadmates having very different personalities and backgrounds, but it will probably be a "one and done" experience. Then again you're not going to buy this game for a 5 hour single player experience, you're going to buy it for the multiplayer. I'm happy to say that despite a few issues the multiplayer experience is good. While I don't like the player progression as much as I did in MW2 it still works pretty well. Players choose one of four classes and then customize their weapon/skill loadouts within those classes. Each class functions very differently but when working together each is equally imperative to victory. Snipers to engage long distance targets and call in mortar strikes, engineers to repair and destroy vehicles, medics to heal and revive teammates, and Assault to... well... assault. I sort of feel like assault gets the short end of the stick here. They get the benefit of a 40mm grenade launcher on their primary weapon and their primary weapons have the best balance of stopping power and accuracy of the lot, but they have no good way to deal with vehicles or a useful skill such as fixing vehicles or healing others. Maybe more skills are unlocked later on (I'm just over halfway through all the unlocks for the class) but I sort of feel left out. Then again there are times when I can outshoot a sniper with an assault rifle so I don't feel too handicapped. The maps, as mentioned, are enormous and there is a nice variety of maps mixed in. 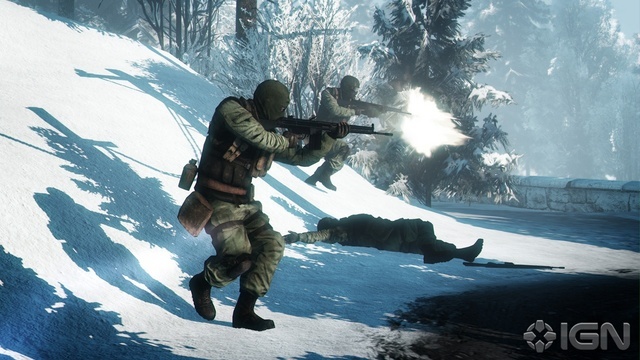 From night-time arctic assaults to desert combat each feels different and plays well. There are a few different game modes but most people will end up playing Rush or Conquest. I prefer Rush with one team attacking and one defending. The object is for the attacking team to blow up a series of M-Com stations (just consider it a "target" as there's nothing special about them) in pairs. After each pair is destroyed the defenders have a few seconds to regroup and prepare to defend the next set. Defenders have an infinite amount of lives but attackers have a small set amount. When a pair of objectives is destroyed the attackers lives completely refills though. I've played matches where an attacking team hasn't been able to destroy a single M-Com station and I've played matches where they have plowed through the level with ease, in the end it is pretty balanced and comes down to who is the better team. Conquest on the other hand is sort of a "multi-king of the hill points" gametype where there are a set amount of locations that each team tries to capture and hold. As you hold a point the enemy's troop counter slowly drains, the object is to essentially outlast the enemy by holding more points. I've only played Conquest once as honestly it's just not as much fun for me. Overall the multiplayer is solid. There are a few issues though, mostly related to connectivity. I have gotten error messages several times where it will not let me connect to EA servers. This is frustrating... very frustrating as essentially you cannot play the game you paid to play online for hours at a time. It's not as bad as it was when the game was first released but they still do happen. Overall I do enjoy the game quite a bit. Is it perfect? No. Could it be better? Certainly. Is it a good bit of fun and am I glad I purchased it? Yes. Will it replace MW2 for me? Absolutely not, nor should it. They are very different games, I play both regularly.